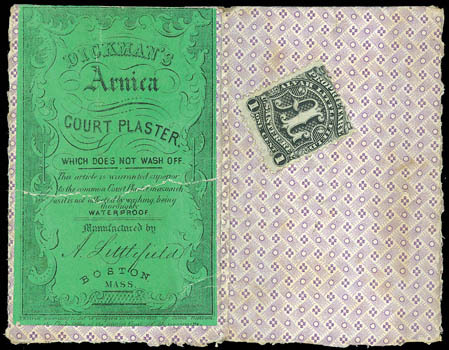 Littlefield, Alvah, 1¢ black, showing major double transfer in lower right portion of stamp, affixed to Dickman's Arnica Court Plaster wrapper; wrapper with small flaws and affixed to card, F.-V.F. Scott No. 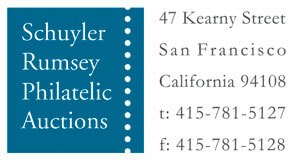 RS164 Estimate $200 - 300. 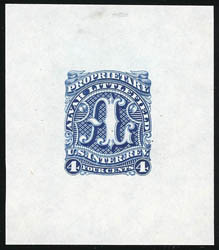 Littlefield, Alvah, 4¢ blue, trial color large die proof, on India (42x54mm), bright and fresh, few small hinge thins at top, otherwise Very Fine. 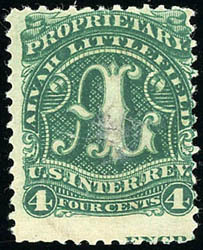 Littlefield, Alvah, 4¢ green, old paper, showing partial NBN Co. imprint in bottom margin, fairly well centered for this notoriously difficult issue, deep color, small sealed internal tears at center, Fine appearance, rare with 21 examples recorded in the Aldrich census (of which 12 are reported to be faulty).